One of the first questions I get asked when a landlubber finds out I work at sea is, “Do you get seasick?” In truth I have, just once. I was cooking lasagna in the galley of a 37 foot sailboat racing upwind in 20 foot swells when the kerosene lamp broke. Taken separately, the confined space, heavy rolls, the smell of lasagna and kerosene never bothered me much, but the combination of all four proved insurmountable. Luckily I just went topside and waited for the cabin to air out but the 60 seconds it took me to escape were pure misery. So what can you do if you are looking to start a career at sea (or just looking forward to your first cruise ship adventure), but find yourself feeling queasy each time you step into a boat? The good news is that 75% of people eventually get acclimated to the sea and are naturally cured of the affliction. For the other 25% of you…. find a new career! 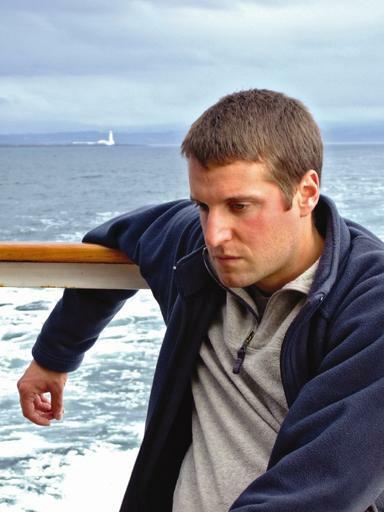 Seriously, I’ve seen seasick people and it looks miserable, truly miserable. Chew gum and eat sweets – Hey didn’t I just say to avoid sugar? Yes but some people swear by it, other think just the repetitive motion of chewing, most effective with gum (ginger gum or candy works best), helps relieve symptoms. No booze – Alcohol can make you sea-sick on dry land, the effects are worse in open ocean so avoid drinking at all costs. Drink Only Lime Juice – Like the saltines, some old salts swear by drinking only lime juice in a storm claiming it helps contract your stomach. We think this is bogus but, if you are going to try it, be sure to avoid all dairy because the mixture of lime and cheese might be great flavor for a dorito but, in real life, they create curds in your stomach. Ouch! Aromatherapy – get a fine mist sprayer (or use an oil diffuser if you have access to power) and fill it with distilled water, lemon oil, cedar wood oil, dill oil, lavender oil, and a few drops of spearmint. Then spray it lightly on your face. Acupuncture – If the band doesn’t work you can try actual acupuncture needles but, be warned, sharp objects and moving ships are not a safe combination (and make sure you know where to stick them!). The Patch – Scopolamine patches are worn behind the ear and look like small band-aids but contain small amounts of medicine which secretes into you skin. They are the most popular prescription drug for seasickness and they also come in pill form. The great thing about the patch is that it continues working even after you start to throw-up. But, be warned, prolonged use of the patch – for weeks at a time – can lead to hallucinations! Avoid Books and Computer Screens – Reading, wether on a device or paper, is a sure-fire way to get you sea-sick. But if you must be sure to read small portions at a time with frequent breaks to look up towards the horizon. If using a computer try a program that reads the text out-loud to avoid fixing your eyes on the screen, or use an e-ink device (like an Amazon Kindle) which isn’t as bright and doesn’t “flicker” like an iPhone or tablet. Buy a program – With names like “The Puma Method” and “Nevasic” a mixture of doctors and hacks offer their training programs for a price. Some are DVD sets and others comes as cheap iPhone apps. Some surely work and others are a scam but all promise to relieve your pain in a few easy steps. Saline Drip & O2 – Between sweating, vomiting and forgetting to eat or drink seasickness can quickly dehydrate you worsening your condition fast. So, for some, a trip to the ship hospital results in an IV and an 02 mask which hydrate and oxygenate the patient making then quickly feel better (FYI – you can purchase just the oxygen bottle over the counter). But a far simpler solution is to drink water and get fresh air before you get dehydrated. Hammock – A simple parachute hammock strung fore-to-aft will let you lay motionless while the ship rolls beneath you. It won’t remove all motion (you still feel the up and down heave of the ship) but it does reduce the rolls. Be A Burrito – If the hammock doesn’t work for you try wedging lifejackets (the bright orange thick cushy ones work best) under your bed to create an acute angle between the mattress and the wall, then climb in. This essentially turns your matteress into a burrito shaped shell, pinning you against the wall and preventing you from rolling in your bed. The “Navy Cocktail” – This remedy consists of a heavy dose of both ephedrine and phenergan taken orally and was reportedly used by both the US Navy and NASA astronauts. We can’t suggest taking either without seeking a doctor’s advice. Drink Coke OR Avoid Coke – Some people swear that Coca-Cola helps prevent sea-sickness others say that it causes it. Some also say that any carbonated beverage will help quite the stomach but that ginger beer works best. Clean Your Ears – Most of us take frequent showers and clean our ears out regularly with Q-tips but, if you don’t, wax build-up in your ear has been reported to lead to motion sickness. Lean Back – Keeping head movements to a minimum may help you reduce the number and complexity of inputs to the brain. To do this recline your chair slightly resting your head. Pull The Trigger – Don’t sit around fearing the sickness and go ahead an tickle your throat by sticking your fingers way down inside. Some sailors swear by it! If you can’t bring yourself to stick your own fingers down your throat (and your dearest friend refuses to help) then try some good old fashion Syrup of Ipecac. Take a Chill Pill – Doctors don’t always do as suggested. I sailed with a doctor once who prescribed Scopolamine to all his patients but, for himself, he preferred Valium. Diazepam , lorazepam, benadryl and klonazepam are all reported by various sources to work but, be carefull, these meds are sedating and can be addictive. Decongest – Stuffed and runny noses play havoc on the inner ear so, some suggest, a Mentholatum Ointment vapor rub or pepper powder to clear the nasal passages while others suggest over-the-counter nasal decongestant. Get Some Rest – Sleep deprivation magnifies the occurrence of motion sickness because, according to US Navy research, it interferes with the vestibular system ( located in small cavities hollowed out of bone within each ear) habituation process. In the maritime environment, this is often a compounded problem since the sleeping conditions aboard a vessel. The solution? Get plenty of rest before the storm arrives. Be Friendly – Some studies have suggested that motion sickness tends to be greater in introverts (Kottenhoff & Lindahl 1960) this may partly be due to their being slower adaptors (Reason & Graybiel 1972).